PeeeM is a chat messaging tool that enables people to connect anonymously by shared interests or locations, rather than the usual ‘who you know’ model, cofounder and CEO Christophe de Courson explained to AlleyWatch. PeeeM also enables you to create public groups, each with an unique ID that can be named and branded, providing endless possibilities for fans, supporters, activists, brands, and more. But wait ! There’s still more to it than that. Users can communicate, share pictures and video and even transfer files between accounts by sharing only their PeeeM numbers They can also safely share their user ids – if they choose – to connect with people one-on-one and start chatting, calling through VoiP and sharing files. Like BlackBerry Messenger, every PeeeM user has an ID number, which is the only identifier for anyone on the network. Users don’t have to register with a phone number, email address, or log in through a social network. The anonymous PeeeM ID is the only information about the user that’s stored on the company’s servers. Which helps to explain why the service has taken off so quickly in countries where there are few human rights, and a lot of monitoring of the conversations. PeeeM recently launched a new version of the app in the App Store and Google Play, and raised $300,000 from an angel investor to fund its expansion to the US, where they’re setting up headquarters in New York – one of the capitals of the world for anonymity (except for all of those pesky video cameras). It’s a crowded space (we mean ephemeral communications apps, not NYC), but de Courson explains the special sauce that just may set PeeM head and shoulders above the competition. 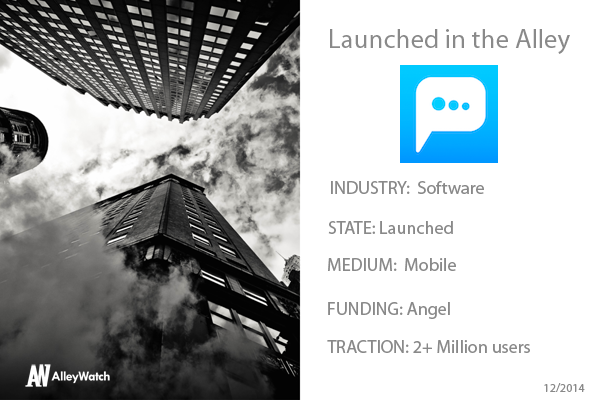 PeeeM is the first open and secure Anonymous Social Messenger of its kind. It introduces new behaviors such as connecting anonymously one-to-one or by group around shared interests, causes, or locations. It is also the first of its kind to enable large mobile-to-mobile file transfers. Users can share their PeeeM ID on Twitter or Facebook to launch affinity groups, friendly chats, or creative collaboration. PeeeM is the first service to offer secure anonymous group messaging, with advanced file sharing capabilities. We have worked on this for several years, and are differentiated by our privacy-by-design technology and our approach to an engaging user experience. We are very pleased to see that the mobile messaging market is being validated by larger players, including Facebook Rooms. We do not believe that this represents a threat, but merely a larger and encouraging endorsement of anonymous messaging. How does the file transfer mechanism on PeeeM work and what makes it different? PeeeM is different because we are the only mobile messaging service that enables direct transfer, or a direct send, between users. We are essentially a tunnel for communication, rather than a cloud-based sharing service, and this enables greater privacy. With services such as WeTransfer, Box.net, Dropbox, there is a link sent from one person to another. With PeeeM, we transfer directly, rather than sharing. We are sending, not “sharing.” If someone is not connected, you cannot send them something. Everything that we do is in the instant, in a real-time manner. This is what enables PeeeM users to have something that resembles real-time conversations. We want to strengthen our market in the regions of the world where we already are, such as the Middle East, Africa and Europe. But we also want to strengthen our presence in the US, because we see that we’re gaining a lot of traction here. What accounts for the considerarble traction you’ve gotten in the Middle East? The anonymous features of the app are very attractive in places where human rights are few. In the Middle East, particularly in a country such as Saudi Arabia, services such as WhatsApp and Skype and other messaging platforms are blocked at least four times a year. For example, homosexuality is forbidden in a country such as Saudi Arabia, and PeeeM could be used for safe, secure communication that is not blocked. So, wouldn’t a repressive regime also block PeeeM from users? On VoIP and file transfer, for example, nothing passes through our servers, because it is P2P, so this is not an issue. With texts, there is encrypted communication, which provides a level of protection. If a regime, or an institution, wanted to block or access our servers, we would not respond. We will never allow anyone to access our servers. As a native French company, free expression is in our DNA. Are you concerned that PeeeM might become the platform of choice for cyberstalkers or terrorists? PeeeM is built in accordance with international regulations, regarding rights of users and the rights of municipalities to potentially seek or monitor illegal or reprehensible activities. We would comply, of course, with requests for assistance in any legal issue with users of our service. As to the question of whether anonymous messaging supports the actions of individuals or groups that wish to evade legal prosecution, we fervently believe that PeeeM can be used for free assembly, in a democratic and open Internet, and can help foster secure communication that thwarts repressive behavior rather than encouraging it. For now, our model is to attract users with a higher level of functionality and ease-of-use. We have a lot of ideas on the whiteboard with our friends here, which includes MintCombine and others. It’s all about market share and gaining more users. Based on our current strategy, we plan to have 5+ million monthly active users within the next eight months. Actually, we have been approached by investors already in San Francisco and New York. We are looking for the best fit, a firm that understands the true and long-term value our service and market. Also one who has built-in synergies with complimentary businesses and services for potential partnerships. Because of its great atmosphere! New York has everything in the world. Not many places can claim that. I spent three months here when I was 19, to learn English. I really liked it and liked the fact that everything is open at all hours and if you want to do something, you can. I also like the atmosphere here. I’m a city guy! Having a presence in NYC is very important to us. San Francisco was an option, but too far from our office in Paris, France and the time zone is to difficult to work with. NYC is perfectly in the middle. We needed to branch out of Europe if we wanted to be part of the global digital ecosystem. NYC is the place to be for funding because of the keen interest our space is receiving from venture capital. What’s your favorite NYC late night eatery? A French restaurant of course! The TARTINERY in Nolita is one of my favorites. I admit that the owner is a good friend of mine.